Contact Education Coordinator, Alison Lee at 540.204.4101 or alee@taubmanmuseum.org. You may also use the link below to expedite your scheduling. The information from this form will be submitted to request your tour. Please note that submission of this form does not secure your tour. A Taubman Museum of Art staff member will contact you with further information to confirm your trip details. 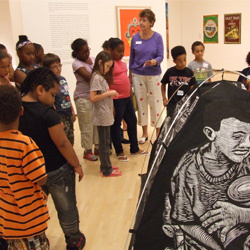 Art Quest tours provide teachers and students the opportunity to see the highlights of all exhibits on display. Teachers can work with the Children's Education Manager to request certain exhibits to focus on. Teachers also receive extended learning lessons that connect to the theme. 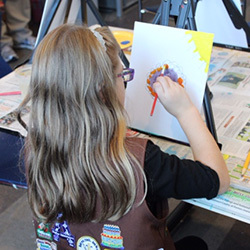 The museum offers scouts the opportunity to work toward their Sculpture, Painting, Drawing, or All Around Art badges! I – Spy tours are specifically designed for preschool groups. 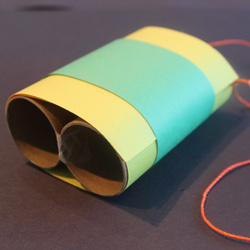 Students create and decorate a pair of binoculars then use them on their guided gallery visit. Students are encouraged to look for details such as colors, shapes, patterns and textures. The tour is broken into 2, 15 minute sections followed by 30 minutes in our Art Venture interactive gallery. I-Spy tours are an effective way to reinforce early learning concepts outside the classroom. The exhibition, Outside Eyes, highlights the interpretation expertise of an array of individuals from various disciplines such as writing, medicine, fashion, finance, and music among others. 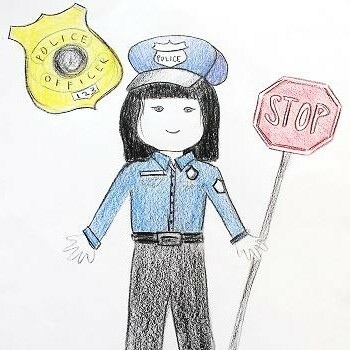 Students will explore different careers being depicted in artwork. Using the works in the gallery for inspiration, students will have the opportunity to identify various careers, and will then create their own depiction of what they want to be when they grow up by drawing, coloring, and decorating with symbols. Through pop-up books, Roanoke native Colette Fu documents her ongoing travels through China’s Yunnan Province, her ancestral home. This exhibition not only follows Fu’s work in China, but also showcases earlier artworks inspired by unique destinations around the United States, demonstrating Fu’s process from photography to meticulously composed collages brought to life through lightboxes and three dimensional structures. Fu’s centerpiece of the exhibition is the world’s largest pop-up book titled Tao Hua Yuan Ji, which measures 13.8 x 21 feet when open. This massive paper structure, inspired by a Jin Dynasty poem about a secret utopian valley, depicts a cave ensconced in giant peach blossoms that Fu visited in 2008. Standing nearly 5-feet tall at its apex, the paper cave is large enough to crawl inside. 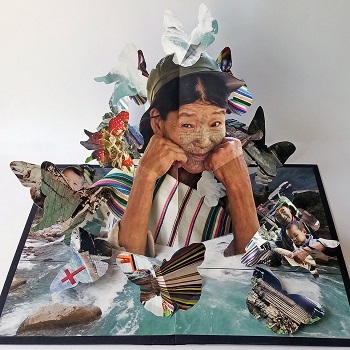 In addition to learning about the Yunnan Province, where 25 of China’s 55 minority tribes live, students will also explore the art of storytelling while observing Fu’s ornate pop-up books, then create their own three dimensional artwork using a variety of techniques. The present exhibition features self-portraits by twelve Midwest Group Painters alongside an equal number of self-portraits by guest artists. Some of the painters, such as Janet Niewald, Jan Knipe, and Bill White, live and work in the Roanoke region or have connections to it. The exhibition ranges from bust portraits against a neutral ground to portrayals that incorporate evocative interior or landscape spaces, and beyond this to a few paintings in which the artist is not represented literally but instead indirectly through allusive objects or motifs. After viewing the portraits in the gallery, students will discuss literal and figurative art, and create their own self-portrait inspired by the works in the exhibition. Bob Trotman’s series Business as Usual is a constantly evolving body of work that satirizes the world of corporate business and high finance by reinterpreting it through the eye of a master artist/craftsman. 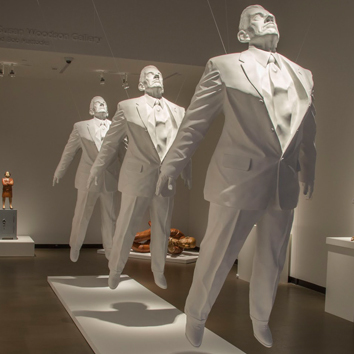 The Taubman Museum of Art’s presentation of this exhibition will debut several new sculptures in addition to artworks from various institutions and collections to explore Trotman’s rich body of work. After viewing and discussing Trotman’s work, students will create their own 3-dimensional sculpture, using design, building, and carving skills. Whereas Harriet French Turner emphasizes the natural world in her painting, Queena Stovall’s subjects are most often people and their activities. Students will study the works in the gallery and create their own piece of art inspired by the work of Turner and Stovall, using their own favorite memory as inspiration. The exhibition, Outside Eyes, highlights the interpretation expertise of an array of individuals from various disciplines such as writing, medicine, fashion, finance, and music among others. Using the works in the gallery for inspiration, the students will take a career-focused tour, use and share their interpretation skills, as well as create a piece of art that encourages them to consider their career goals and aspirations. This gallery includes paintings, sculpture, prints, photographs, drawings, and glass. 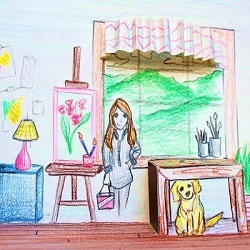 After comparing and contrasting the works in the gallery, students will create their interpretation of their own career aspirations and goals using a variety of two-dimensional and three-dimensional techniques. 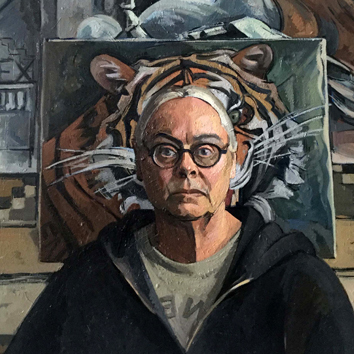 The exhibition features self-portraits by twelve Midwest Group Painters alongside an equal number of self-portraits by guest artists. 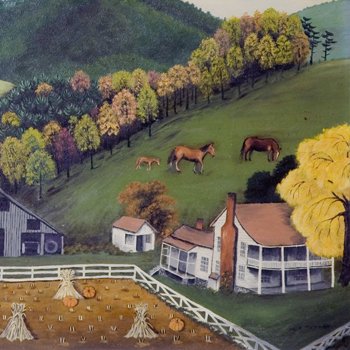 Some of the painters, such as Janet Niewald, Jan Knipe, and Bill White, live and work in the Roanoke region or have connections to it. The exhibition ranges from bust portraits against a neutral ground to portrayals that incorporate evocative interior or landscape spaces, and beyond this to a few paintings in which the artist is not represented literally but instead indirectly through allusive objects or motifs. The exhibition, Outside Eyes, highlights the interpretation expertise of an array of individuals from various disciplines such as writing, medicine, fashion, finance, and music among others. Using the works in the gallery for inspiration, the students will take a career-focused tour, use and share their interpretation skills, as well as create a piece of art that encourages them to consider their career goals and aspirations. Featuring a broad sampling that includes paintings, sculpture, prints, photographs, drawings, and glass, Outside Eyes focuses on artists who came to the forefront between the 19th century and today, a particularly dynamic period in art being made worldwide. After comparing and contrasting the works in the gallery, students will create their interpretation of their own career aspirations and goals using a variety of two-dimensional and three-dimensional techniques. Join us for a linguistic experience like no other! 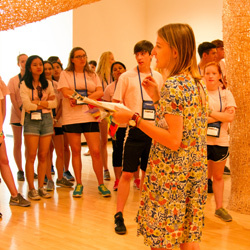 Middle and High School students are invited to strengthen listening and conversation skills in German, French, or Spanish while enjoying the Taubman’s fantastic exhibitions. To best enjoy the touring experience, the level of fluency can be adjusted based on individual class needs. Language tours must be scheduled at least 2 weeks in advance.